We have recently been included on Checkatrade and have already received some excellent reviews! Have you used our service? Would you mind clicking through to the Checkatrade site and leaving feedback for us please? To visit our Checkatrade page, simply click the profile below. Movement of pallets across the south east. Collect various pieces of furniture from depot and install in a school. Man & Van Epsom Downs Limited are registered with the Environment Agency’s register of waste carriers, brokers and dealers. Our registration number is CBDU177461. We are registered as an upper tear, carrier dealer. For more information on companies registered with the Environment Agency please click here. 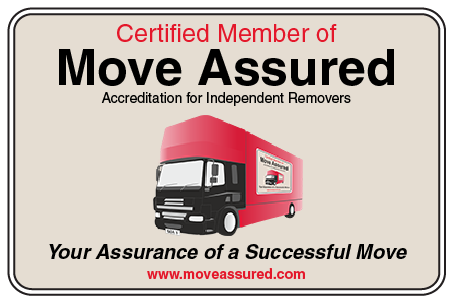 We take pride in our membership of Move Assured, which is an association of Independent Removal Companies. Being a member of this group enables us to network, offer advice and discounts to any fellow members. To see our entry on their website CLICK HERE. We are delighted to announce we have been issued a Scrap Metal Dealers Collector’s Licence by the Borough of Reigate and Banstead. Scrap metal dealers must apply to their local authority for a licence under the Scrap Metal Dealers Act 2013. A person carries on business as a scrap metal dealer if the person either carries on a business which consists wholly or partly in buying or selling scrap metal, whether or not the metal is sold in the form in which it was bought, or carries on business as a motor salvage operator. The collector’s licence authorises the licensee to operate as a mobile collector only in the area of the issuing local authority, permitting them to collect scrap metal as appropriate. This includes commercial as well as domestic scrap metal. If a mobile collector operates within more than one local authority’s district, a licence will be required for each authority that (s)he operates in. Please note: A licensee can not hold both a site licence and a collectors licence issued by the same authority. In addition, one can not hold more than one site licence issued by the same authority but can hold site and/or collectors licences in other authorities.